Simply divide your hair into two sections, twist your hair in on itself, and bun it up. Secure with a ponytail holder. To band your hair, section it off and wrap a ponytail holder around the first section. Continue to place ponytail holders down the hair shaft, spacing them out a bit in order to let the hair “breathe.” Doing this elongates your hair and will result in a bomb faux blowout! Flip your hair up into a high ponytail and secure with a clip or ponytail holder. Doing this stretches out the roots of your hair and is great to do overnight. 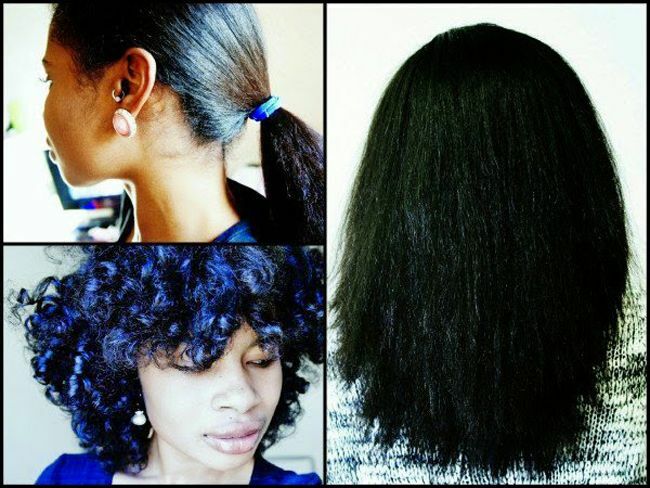 Install a style that will stretch your hair such as braids, twists, flexi rods, curlformers, or rollers in your hair. For braids/twists, the amount will depend on your length but typically, anywhere from 2-8 braids is sufficient. If you have tightly curled hair, braids will produce a better stretch than twists will. If you choose to install a roller of some sort and want maximum stretch, wrap your hair after taking them down and wear a scarf overnight. Make sure to do this on a cool setting. Simply pull a section of hair taut and blow dry your roots, using the nozzle end on your blowdryer. This will provide instant stretch if you’re pressed for time. This is called the tension method. This article is written by BlackNaps for CurlyNikki.